Yes, you read that correctly! The much beloved Zoo Keys, sponsored by 6ABC, returned this past Saturday, April 6th and can be purchased at the Gift Shop for around $3 each. There will be a variety of animal and color options available, including the lion and elephant. However, don’t forget to grab a lanyard as well to keep it safe! This past week, Philadelphia Zoo President, Vik Dewan, began a ceremony to celebrate the newest additions to America’s First Zoo. He introduced the media to Creatures of Habitat, which consists of 12 animal vignettes made from hundreds of thousands (and thousands of pounds) of LEGO bricks crafted by NY-based artist Sean Kenney. Each of these life-size creatures has an audio box, recorded by Philadelphia’s own zookeepers in both English and Spanish. Just turning the key in these boxes will teach a lesson about the animals in the zoo and the efforts Philadelphia Zoo makes towards conservation. Each of the 12 sculptures includes the audio box, as well as a board that speaks about the efforts being made to keep these animals safe and thriving. Throughout the year, 7 of the locations will also feature games or activities for kids to get involved. For example, the terrapin sculpture describes how the Zoo Crew, a youth mentoring program promoting career exploration, goes to New Jersey to put plastic tubes along highways to keep turtles off of roads. An intern will be at that audio box with a puzzle game for kids to maneuver a turtle through a maze of cars. The chameleon statue features a large tub of different animals and children move them to different buckets based on which ones are meant to be house pets. All of the locations can be found in the brand new zoo maps at the entrance. Along with these Creatures of Habitat and Zoo Keys, we were able to learn about another initiative, known as a trailer farm. Hassan, one of the most outgoing and knowledgable people I saw that day, described the concept to us. In short, it is a trailer that can produce the same amount of food as two acres of land. Because it is indoors, there is no need for pesticides and it is a huge water saver. Since the water does not evaporate inside the trailer, they can save 70-90% of the water that would be needed to grow the crops outdoors. The trailer farm has been used in Dubai and there are plans to spread it across third world nations. Hassan, “the black Steve Irwin” teaching guests about the trailer farms. There is also the brand new Urban Green towards the back of the zoo. It features plenty of outdoor seating and three food trucks. Pressed, will feature panini-style sandwiches, including a cheesesteak and pork roll. Fry Bowl, will sell…fry bowls. You can get a bowl of seasoned waffle fries with different toppings including pulled pork, cheese, bacon, and pancetta. Lastly, Root to Leaf will consist of healthy plant-based foods like veggie burgers and salads. The Urban Green features seating and 3 food trucks. For those wondering about the damaged Zoo Balloon, our guide Danielle gave us the scoop. It was torn in a storm and sent away for repairs. For some reason, it was returned without being fixed. Since the maker of the balloon is in Europe and is one of the only companies in the world that makes the balloon, it could take years before we see it float again. In the meantime, a new ropes course called Wild Works will take its place, opening at the end of May. All of these new features add to the popular Watering Hole Beer Garden, the Amazon Rainforest Carousel, and the Swan Boats. 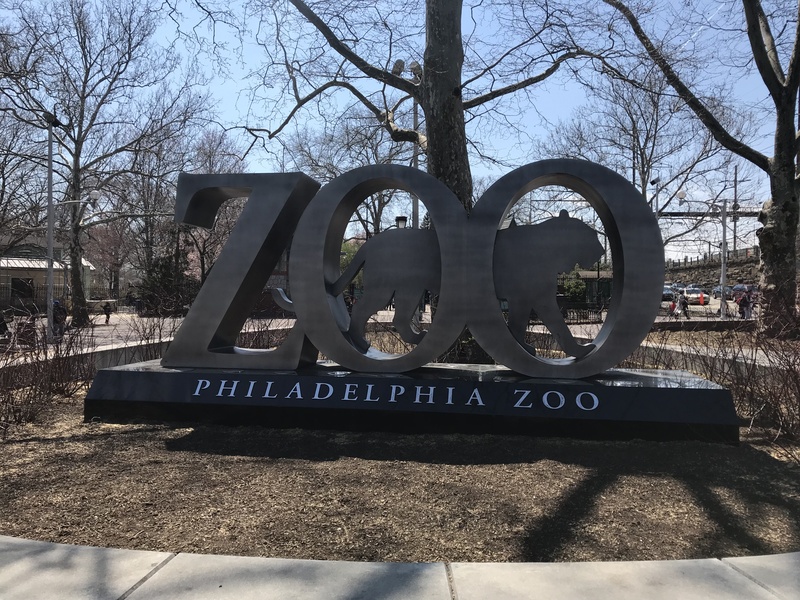 Learn more about all of these attractions, Urban Green menus, and the Philadelphia Zoo’s effort towards saving wildlife on their website. Thank you to the amazing Philadelphia Zoo team for their hospitality and knowledge. Previous Arden Theatre Company’s Celebrated Production of ONCE Returns for a One-Night-Only Musical Benefit!